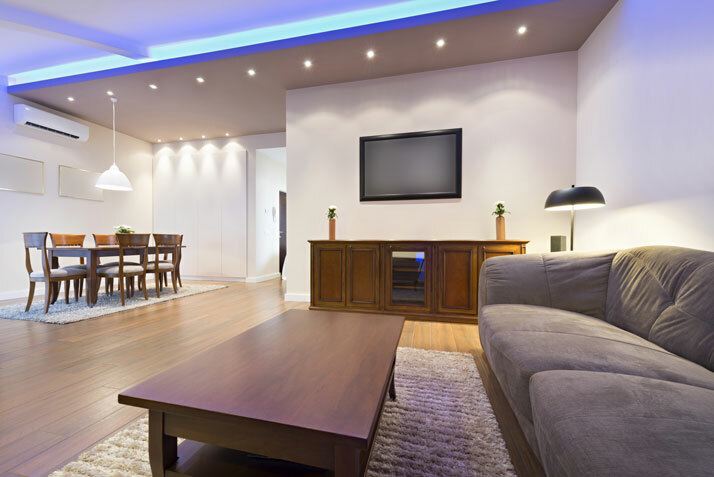 Light-emitting diode bulbs, or LED lights, are beneficial for use in any area of the home. While it may seem appropriate to use halogen or incandescent bulbs, these bulbs and fixtures are actually detrimental in terms of aesthetics and efficiency, driving up replacement costs and creating harsh lighting in the spaces of your home. Use LED track lighting for versatility and precision when it comes to illuminating reading spots or entertaining spaces. Take advantage of LED light fixtures to bring out the true colors of your home's furnishings. Each LED bulb offers approximately 50k hours of lighting, compared to around 1,200 hours for the same wattage incandescent bulb. LED bulbs are cooler, which makes them safer for use around furniture and upholstery. Opt for dimmable bulbs when possible for flexibility and convenience. Look for bulbs that are around 50-watts for nighttime reading illumination. Add LED strip lights behind your headboard for a warm ambience and relaxing mood. Opt for color-changing LED bulbs to change the room's atmosphere. Try LED strip lighting under your bed for a clever and safe night-light. LED track lights in the kitchen offer ample illumination overhead for culinary tasks while emitting less heat. Use LED bulbs in the pantry and position them to cast light down and in front of your stored goods. Use LED tape lighting under cabinets and in drawers to gain illumination where you need it most. Try LED bulbs in your ceiling fans to make your entire room cooler. Use LED tape lighting around your garage door for illumination when returning home. Create a focal point in the yard by lighting up landscaping with stake lights equipped with efficient LED bulbs. Visit home improvement retailers to view a large array of LED lighting fixtures, features, and bulbs.